Soris Arenim is a Dunmer commoner living in the Imperial City's Talos Plaza District with his wife, Erissare Arenim. It seems that Soris has a penchant for mage's staves. Soris leads a very quiet life and never even leaves the house, a routine fortunately shared by his wife, Erissare. After waking up at 6am he enjoys a two-hour breakfast, then strolls around on the ground floor until his bedtime at 10pm. A bit of variation occurs on all regular weekdays (Morndas to Fredas), when fellow Dunmer and neighbor Ulen Athram pays him a visit between 1pm and 6pm. He wears a middle-class outfit consisting of a burgundy linen shirt, tan linens, and a pair of doeskin shoes. He carries the key to his house, as well as a leveled amount of gold. Soris will introduce himself when you first talk to him: "Good day, stranger. Soris Arenim is my name." When asked about the Imperial City, Soris will respond rudely: "I don't know. Just take a walk around. Buy something. Plenty of stores. Why'd you come in the first place?" 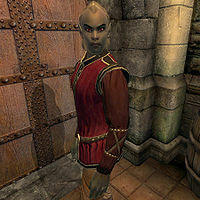 Once you have completed the Bravil Recommendation, people in the Imperial City may tell you one of two rumors, based on how you acquired the staff: "Soris Arenim sure seems upset. I think he lost something important." or "I heard that Soris Arenim made himself quite a bit of money recently. He seems very happy about it."